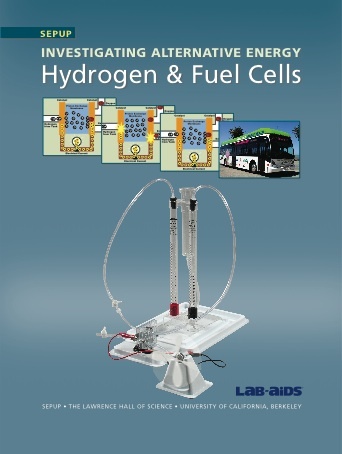 A hydrogen fuel cell converts chemical energy stored by hydrogen fuel into electricity. In many ways fuel cells are similar to batteries, such as those you might find in a car or in a portable electronic device like an MP3 player. However, there are some important differences between batteries and fuel cells. Similar to a battery, a fuel cell with a supply of hydrogen and oxygen can be used to power devices that use electricity. While both batteries and fuel cells convert chemical energy into electrical energy, batteries store this chemical energy inside the battery itself. This means that a battery will run down, or need recharging, when there is no longer enough stored chemical energy available to produce sufficient electricity to power the device connected to the battery. Rather than storing chemical energy inside itself, a hydrogen fuel cell receives a supply of chemical energy from the outside. This chemical energy is stored in the hydrogen that is supplied to the anode of the fuel cell. A hydrogen fuel cell essentially consumes hydrogen and oxygen. When a fuel cell is continuously supplied with hydrogen and oxygen, and the product water is removed, the fuel cell can generate electricity. Hydrogen fuel cells and batteries are both electrochemical cells. They each have two electrodes in contact with a material that can conduct ions, called an electrolyte. One electrode is the anode and the other is the cathode. In a hydrogen fuel cell electrons are released from the hydrogen that is supplied to the anode whereas in a battery the electrons are released from the material in the anode itself. Because battery electrodes actively participate in the conversion of chemical energy to electrical energy, over time this can have a damaging effect on the electrodes and therefore on the effectiveness of the battery. Unlike batteries, the electrodes in hydrogen fuel cells are relatively stable since they act as catalysts in the release or acceptance of electrons and are not chemically changed during this process. When pure hydrogen is used as the fuel, the only by-products generated from the fuel cell are pure water and heat. This makes fuel cells potentially very efficient devices with minimal environmental impact. Often both of these by-products can be put to some kind of use. For example, the heat can be used wherever a heat supply is needed. Fuel cells have been used in NASA space-craft since the Gemini program in the 1960’s and even today they provide electricity and drinking water for astronauts on Space Shuttle flights. Because hydrogen does not occur naturally in the environment, hydrogen fuel must be derived from other substances that contain hydrogen such asmethanol, gasoline, natural gas, and water. Most hydrogen that is produced today comes from natural gas. If hydrogen is made from water the only byproduct is pure water. If fossil fuels are used as the original source of hydrogen there will be more by-products, such as carbon dioxide. When hydrogen is produced from water electricity is used to split the water molecule. If that electricity comes from a renewable energy source such as wind or solar power, then the resulting hydrogen is a renewable, zero emission fuel. The oxygen is typically obtained from the air, though it can be provided directly as pure oxygen. Hydrogen gas is supplied to the anode of the fuel cell. The anode is coated with platinum, which acts as a catalyst to break down the hydrogen into protons and electrons. If a circuit is connected between the anode and cathode then the electrons can travel through the circuit and provide power to any load that is connected as part of the circuit. In a PEM fuel cell bipolar plates are positioned at either side of the cell. They help to distribute gases and also serve as current collectors. The electrolyte is contained in a membrane between the anode and cathode, which are all sandwiched between the bipolar plates. The membrane allows only protons to pass through and is called a proton exchange membrane, or PEM. In order to work properly the membrane must be kept moist. A typical hydrogen fuel cell produces 0.5 V to 0.8 V per cell. To increase the voltage individual cells can be connected in series. This arrangement is called a fuel cell stack. The cross sectional area of a fuel cellaffects its ability to produce current. Greater area means more reaction sites, and this allows more current to be generated. Current times voltage equals power. So, by stacking cells in series to build voltage and increasing cell area to boost current, it is possible to generate very large amounts of electrical power‚ enough to supply a block of houses, a hospital, or a vehicle such as a car, bus, even a submarine or space capsule! 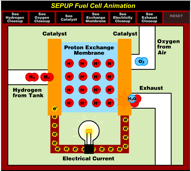 Click on the SEPUP Fuel Cell Simulation on the right to launch the simulation in your browser. Adobe Flash is required to access this simulation. If you are having trouble accessing it, please be sure you have installed the latest version of Flash on your computer. Still having trouble? Email us. Is hydrogen a source of energy? Hydrogen is not a source of energy, while solar, wind, natural gas and oil are. There are no naturally occurring sources or reservoirs of hydrogen on earth. Hydrogen can be extracted from fossil fuels, or can be produced by using the process of electrolysis to split water into hydrogen and oxygen. Both of these processes require energy. This energy can be provided by fossil fuels or by renewable sources of energy such as solar or wind. The hydrogen must be kept in a suitable container until it is ready to be used in a fuel cell to produce electricity. In this sense, hydrogen is a way of storing and transporting energy, but not a source of energy itself. There are already many well-known types of devices that produce electricity, why should we consider another type? Every device has advantages and disadvantages that influence its suitability for use in a particular application or location. Hydrogen fuel cells have some unique characteristics that make them more suitable for certain uses than other sources of electricity. The fuel cell itself is silent, although the equipment used to provide the hydrogen and oxygen may not be as quiet, depending on the type of equipment used. Being quiet makes fuel cells especially suitable when they are used in places that are close to people. Also, fuel cells do not emit pollutants or toxins, so they can be used in enclosed areas without negatively affecting human health. They are also modular, meaning they can be stacked to generate various amounts of power as needed. Fuel cells are also very efficient at converting chemical energy into electrical energy. Fuel cells can offer many potential benefits over batteries. Batteries can be recharged just as a canister of hydrogen can be refilled, but the capacity of batteries decreases over many recharge cycles. A container for hydrogen and a fuel cell, on the other hand, do not degrade over time. Furthermore, once batteries are fully charged, they continuously “leak” energy when not in use, while a container of hydrogen does not leak and has a longer shelf-life. Additionally, a container for hydrogen can typically be refilled with hydrogen from an external source much faster than a battery can be fully recharged. When batteries are used in an electric vehicle, the performance of the vehicle degrades as the battery discharges. In contrast, fuel cell performance remains the same as long as there is hydrogen fuel in the tank. Are hydrogen fuel cells safe for people and the environment? Hydrogen is very combustible, just like gasoline. However, containers suitable for holding hydrogen are put through many rigorous tests to make sure they are safe for the public. Hydrogen is composed of very small, light molecules, and is much less dense than air. This means that a hydrogen leak will tend to disperse very rapidly upwards into the air, unlike a gasoline leak that will pool below a vehicle and remain a hazard until it evaporates. The same precautions that people exercise at gas stations must also be used at hydrogen filling stations, such as not smoking and not using a cell phone. The only by-products from combining hydrogen and oxygen in a fuel cell are water and heat, so hydrogen fuel cells do not emit greenhouse gases or other air pollutants as engines that use fossil fuels do. However, to produce hydrogen one must use another source of energy. If fossil fuels are used as either the source of hydrogen or the source of energy for producing the hydrogen, then the net process does produce greenhouse gases. If water is used as the source of hydrogen and the process of making the hydrogen is powered by renewable sources of energy, such as solar or wind, then the use of hydrogen fuel cells is completely clean and sustainable and adds no greenhouse gases to the atmosphere. Are hydrogen fuel cells a new idea? Sir William Grove demonstrated the concept of the fuel cell in 1839. However, it was not until 1932 that Francis Bacon developed the first successful fuel cell. Limited progress was made over the next quarter century. The pace of development increased around the time that NASA began to research the technology for use in the Gemini, and later the Apollo, programs. Fuel cells are also used on the space shuttle fleet. Can hydrogen fuel cells be used to power a vehicle? Hydrogen fuel cells can be used to power any device that uses electricity. So they can be used to power vehicles that run off electricity. How does the level of efficiency of a hydrogen fuel cell compare to other devices that produce electricity? Fuel cells convert chemical energy directly into electrical energy. Since each energy transformation involves some amount of energy loss, the fuel cell is more efficient at producing electricity than a heat engine. Fuel cells operate at an efficiency of about 40 to 50%. Compare this to a fossil fuel fired power plant, which is typically 35% efficient, and the internal combustion engine in most vehicles, which operates at about 15% to 20% efficiency. Are hydrogen fuel cells in use today? Hydrogen fuel cells can be found in many different places today. Because the technology is still developing, most fuel cell applications to date have been for demonstration projects. Applications have included small handheld devices, such as cell phones and laptop computers, electric vehicles, from passenger cars to buses, and stationary power for office buildings, hospitals, and other large commercial and institutional facilities. They are particularly useful in indoor warehouses to power forklifts because they don’t emit any noxious fumes. They are also used in remote places where access to a conventional power supply is limited or impossible, such as off-grid home-sites and field weather stations. Currently fuel cells can be found from above the Earth (in the space shuttles) to below the ocean surface (in some of the most recent submarines), and they are likely to be used more in the future.